As ovens gear up for hours of Christmas baking, it’s this time of year when I stock up on marshmallows. Yes, my name is Jen, and I am a Rice Krispie treat-a-holic. It started in college when I won fame and honor by providing friends, namely the Mens Basketball Team (don’t judge) with Rice Krispie treats on demand. It doesn’t take much in college, you know. Just mix marshmallows, butter and Rice Krispies, and have a $10 yard sale microwave at your disposal. Yes, you too can be a hero. My problem grew from there. I then discovered adding peanut butter and chocolate to the mix, and I was done for. I now pass on this addiction to my girls. They too may soon enjoy the notoriety that comes from being a Rice Krispie connoisseur. 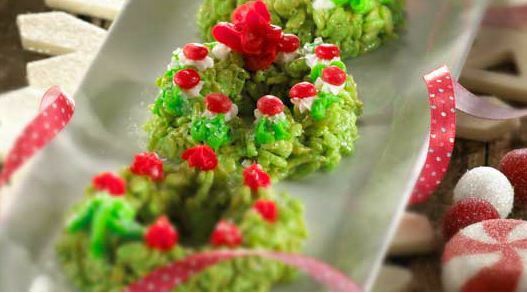 and I always makes Rice Krispies Christmas Wreath. The wreaths started when I was short on time, and knew that these could be made much quicker than any dough, plus I didn’t have to heat up my oven. I love that! 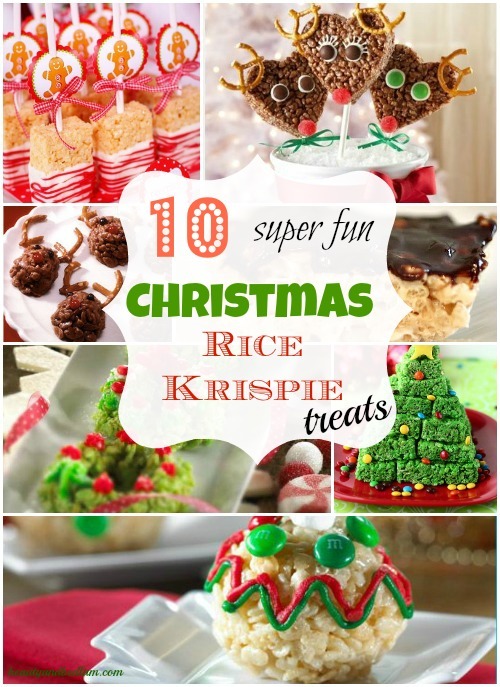 And it’s one of the reasons I love Rice Krispie Treat ideas – quick, easy, frugal ingredients and rave reviews. 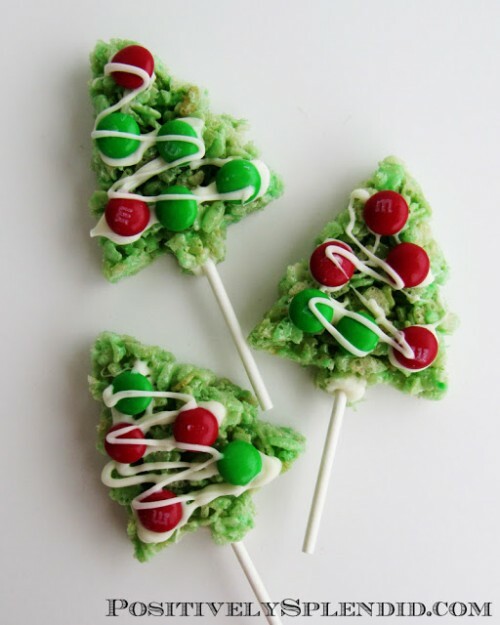 Another benefit of Christmas Rice Krispie Treats is that you can make the Basic Rice Krispie Treats mix in bulk and then divide it for multiple treat ideas. 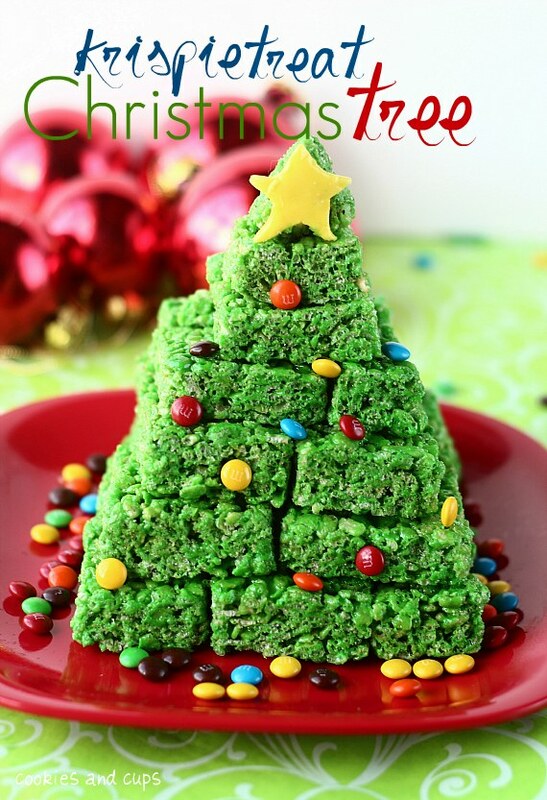 For instance, add in green food coloring and make the Christmas wreaths above, as well as this adorable Christmas Tree presentation like Cookies and Cups did so beautifully. Stack your green treats for a great centerpiece. These match right up with my 10 Minute Dinner philosophy. 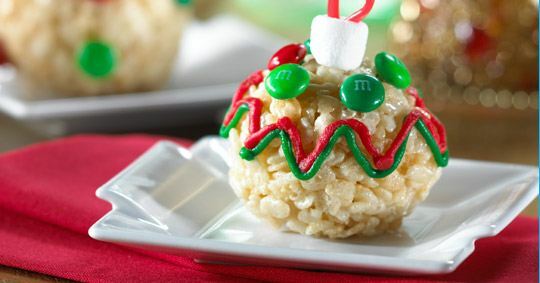 She used the store bought Rice Krispie Treats for a super quick idea. My sweet friend, Amy, did adorable ornaments. Perfect for a centerpiece. See directions at Amy’s Finer Things. 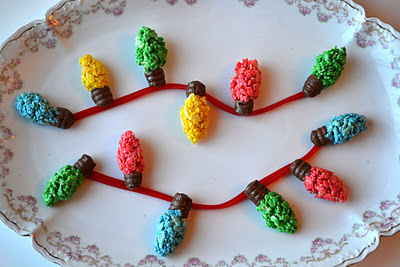 Aren’t these Christmas Tree Lights adorable? Maybe a bit more time consuming, but so cute. Inspired at Sweetology by none other than Rice Krispie themselves. Using my favorite Twizzlers to string them up, there’s a perfect pairing of my favorite things. My precious in real life friend, Jen (Quatro Mama) from 4tunate shared her Rice Krispie Treat Christmas Present. Isn’t it fantastic? Check out how she put it together. 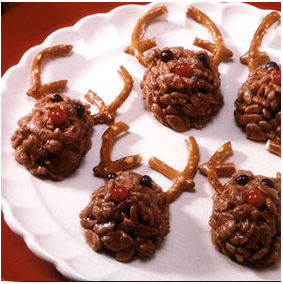 Again, the basic Rice Krispie Treat mix with just a few tablespoons of cocoa give you the mix for a great basic Rudolph treat. 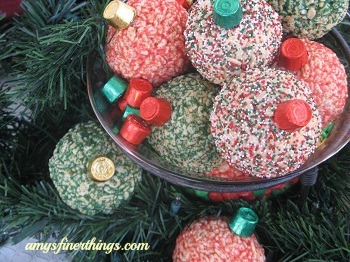 A very fun, frugal and creative gift giving idea would be to give a sweet Rice Krispie Treat gift basket. Add in the book with lots of treat ideas,a box of cereal, marshmallows and a few adorable cookie cutters, (yes, 101 for under $10 shipped free) you’re sure to make even the most novice in the kitchen swoon. And if you aren’t in the mood for anything fancy, you can always just enjoy these straight from a big bowl. 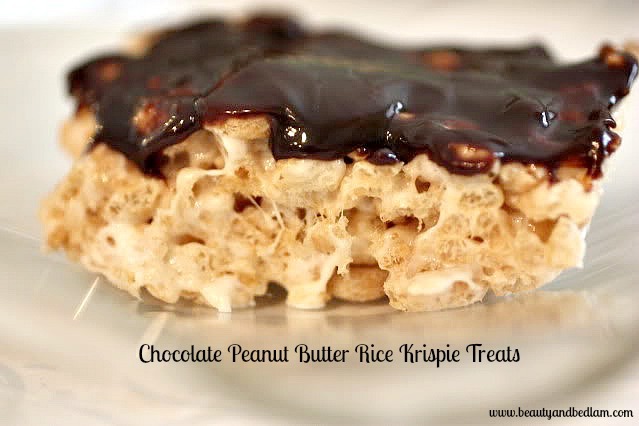 Yes, we love my Chocolate Peanut Butter Rice Krispie Treats that much. 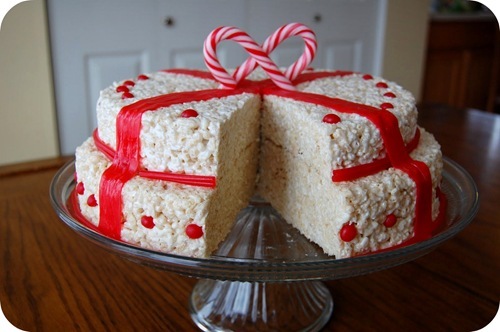 Merry Christmas and enjoy a perfectly wonderful Rice Krispie treat filled day. With all these ideas and inspiration, who can’t rush to make some? By all means! Of course! Way way Cute!! I loooove Rice Krispies Treats.. Probably more than most other things. 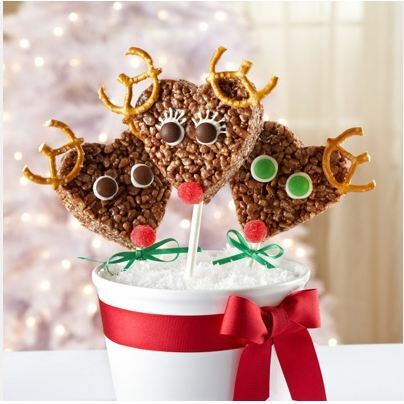 Cant wait to make some of these.. How cute!! Im excited! haha..
Ah, a woman after my own heart. 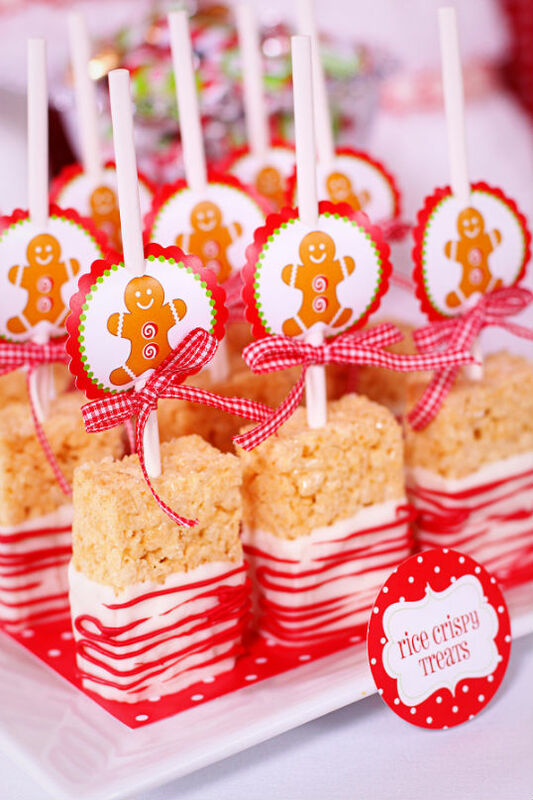 I love rice krispie treats and at one point thought it could be a brilliant idea to create ones of all different types and flavors to sell at a farmers market or community bakery or something. We made some with Maine blueberry syrup and I have a recipe on my blog for what I call “Elvis rice krispie treats” because they are banana peanut butter. Sounds disgusting, but quite good! what a fun round up! LOVE! i was wondering if there is any for thanks giving. i am making crispy treats but i need ideas and i found this website and wondered if they could help me ? so can you? I love forming Rice Krispie words like Peace, Joy, Hope and using them as gifts. I often put them on foil lined cardboard to give an attractive look. One of my goals is to make “Joy” words to distribute when out church goes caroling in neighborhoods.